Any fans of Park Shin Hye here? Pretty sure this actress doesn't need any introduction as i heard there's a large percentage of Malaysians follow K-drama and definitely would have come across Park Shin Hye staring in a few titles. Probably only people like me are slightly slow to catch up on the hype because i don't have time to drool over oppa-s because scared later my expectation of men become too high again then difficult to look at our local guys liao ahaha! No joke man, the amount of people that flocked One Utama on a weekday just to meet this beautiful Mamonde ambassador, it's like every floor is crowded to the brim and security was tight too (precautions needed for crazy fans). The reason of her presence here in Malaysia was to launch Mamonde Flower Day and event that inspires people to show their feelings whether it's thankfulness, love, friendship, etc by giving them a gift of flower. Hibiscus is one of one Mamonde's flower ingredient in their line of skincare which consists of Honeysuckle, Narcissus, Lotus and Camellia. Malaysians an appreciation for flowers as a symbol of love and gratitude towards nature and mankind. 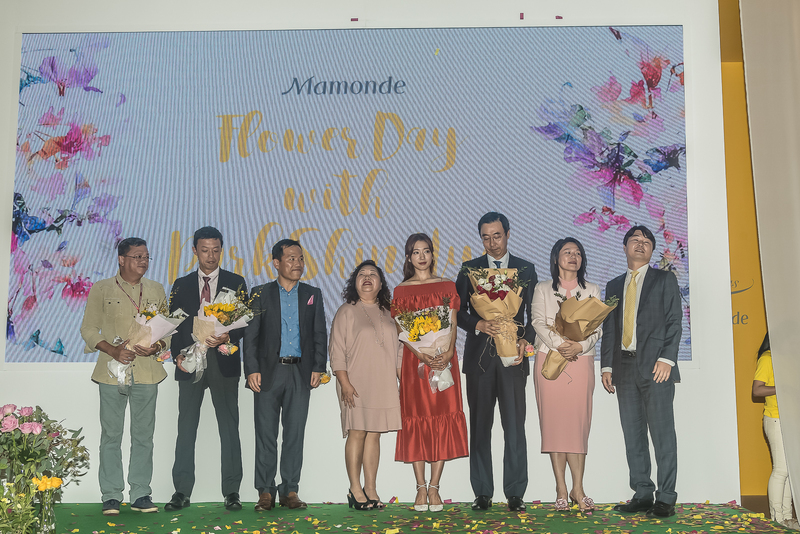 We are truly honored to have Park Shin Hye grace our event as she personifies the true beauty of a flower and what Mamonde stands for,” said Celine Diong, Brand General Manager of Mamonde Malaysia. Aside from this, Mamonde also took this opportunity to introduce their newest family members of the Moisture Ceramide range (Hibiscus) – the Moisture Ceramide Skin and Softener and Moisture Ceramide Emulsion. These series contains natural moisturizing ingredient that's derived from the Hibiscus and ceramide which works effectively to lock in moisture and giving the skin a healthy glow. Basically it works by making sure your skin is hydrated enough so that signs of ageing (haggard/ dull) of the skin can be reversed/ prevented.